There are 2 options for entering Master Mode; bring Pin 27 HIGH or bring pin 28 HIGH. Pin 27 allows you to use software and pin 28 allows you to use a hardware switch. When pin 27 is HIGH you use AT commands to enter Master Mode. When pin 28 is HIGH (and pin 27 LOW or NC) the modules automatically switch to Master Mode. To me both ways are about the same and I decided to go with pin 27. So, to get pin 27 HIGH I soldered a wire between pin 27 and the EN pin on the breakout boards. I used wire wrap wire which is fine single core and ideal for this kind of thing. Not the finest example of soldering but good enough. I realized after I soldered the wire that I didn’t know if the EN pin was actually used on the FC-114 modules. However, pulling EN HIGH does get me in to AT Mode and does not seem to affect the modules in any other way. 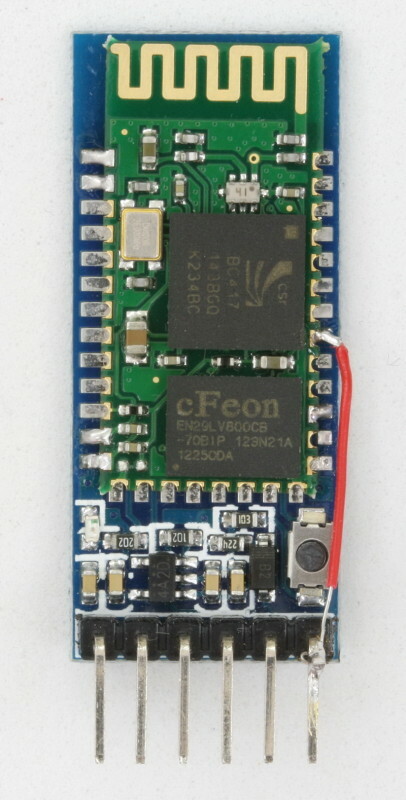 The EN pin when brought LOW disables the module, same as the zs-040 modules. Since I am unlikely to use the EN pin to disable the module I am leaving the wire as it is. You may not want to connect it. Remember that the pins on the mini BT board are 3.3v only. So to pull pin 27 HIGH you need to use 3.3v not 5V. Here is the bread board set up. The EN pin is connected to a voltage divider (a 1k ohm resistor and a 2K ohm resistor) and then to 5V. The voltage divider reduces the 5V to 3.3v. Make the connections and upload the following sketch to the HC-05 FC-114. I have a HC-06 on a separate bread board. I’m not doing anything with this except powering it and allowing the HC-05 to connect to it. Open the serial monitor and cycle the power to the HC-05 FC-114. The LED on the HC-05 should be blinking; 1 second on, 1 second off. AT+ROLE1 puts the module in to Master Mode. 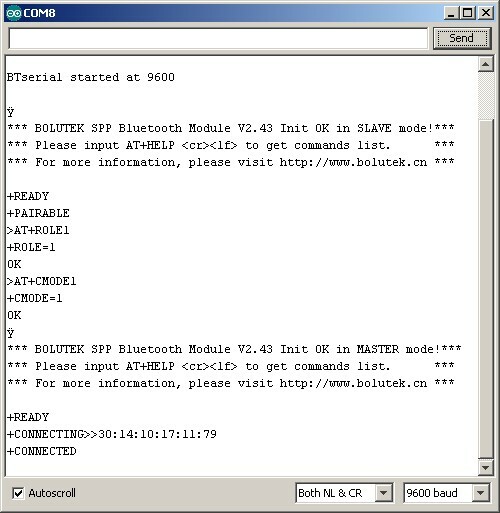 AT+CMODE1 allows the module to connect to any other BT slave device. The LED should still have the same blink pattern; 1 second on, 1 second off. The LED on the HC-06 should be blinking about 5 times a second. With the serial monitor open cycle the power to the HC-05. The welcome message should now say “MASTER mode”. When you re-power the HC-05 it will search for connectible Bluetooth devices and then auto connect to the strongest signal. While it is searching the LED will blink quickly 3 times every couple of seconds. Connection should take no more than a couple of seconds. Once connected, the LED on the HC-05 is constant on. 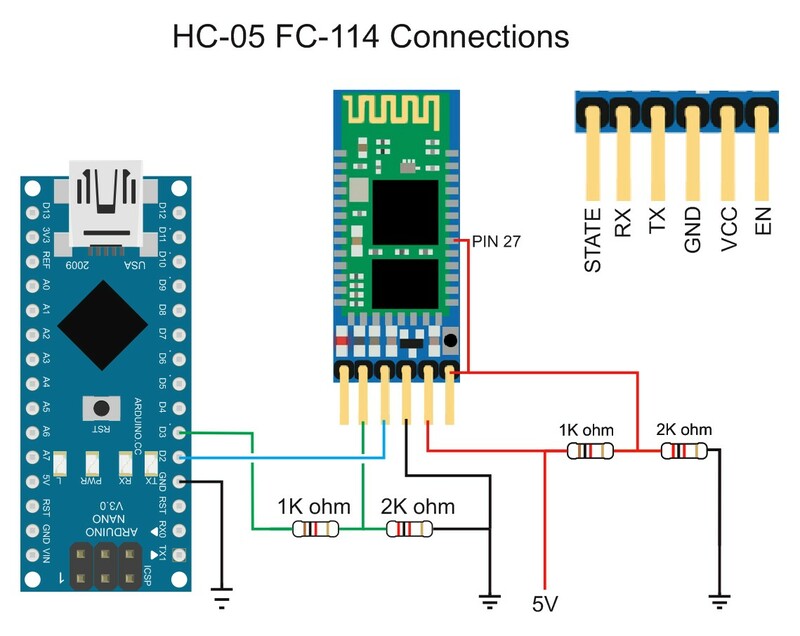 One of the nice things about the HC-05 Fc-114 modules is that they output the current status and you can monitor when they are connecting and then connected. The module seems to remember the first slave device it connects to and will try to connect to the same module when the power is cycled. I have set up 2 more HC-06s and these seem to be ignored, even when the original HC-06 is not powered. Once the module has been set up you no longer need to have pin 27 HIGH. The HC-05 Fc-114s will auto connect even without power to pin 27. I have now been playing with this for a couple of hours, constantly stopping and starting the HC-05. It always connects to the original HC-06 even when other HC-06s and HC-05s (in slave mode) are available. I have another version of HC-05 FC-114. This one say VERSION:2.0-20100601 and comes with other AT-commands. Hi Thanks for sharing ! I really need your help. One computer, 2 serial monitors. I have IDE version 1.0.5 installed and I also use the portable version of 1.6.3. Thank you for your answer! I have one more question. I thought you posted just hc05 master module cording but it was hc 0x. Do i have to use this cording in 05 and 06 modules each other?? Do i have to change “x” into “5” or “6” as well?? The sketch works with HC-05 and HC-06. The x replaces the 5 and 6. Hi, Sir. ! you can help me a question? I own two HC-05. I have a code adapted to create USBs gamepads for AVR microcontrollers. 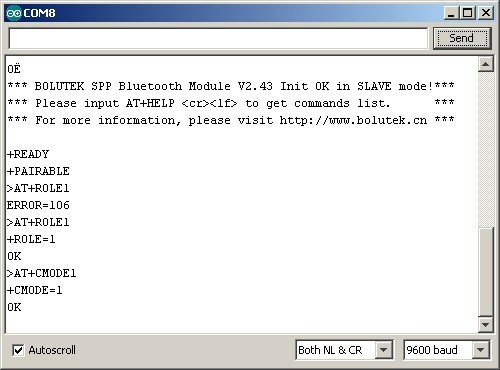 When I connect the AVR into a USB port and place one of the Bluetooth modules as “Slave”, this device receives signals from any Android device through Bluetooth communication. I can control games on PC, with my Samsung Galxy, for example. I am trying to adapt a design of a SNES controller to Android, via Bluetooth and Arduino, to make the SNES controller can send signals via bluetooth to my “AVR USB gamepad”. But I have doubts on the question of pairing. The modules connect only if one is in Master mode and the other in Slave Mode. In the example of the SNES Arduino control for Android, the module must be in Slave mode. If the module is in Master mode, no Android is able to recognize it. I can make two HC-05 modules connect both being as “Slave”? Because I think the module as “Slave”, the module is “Transceiver”. If I can not connect both modules as Slave, how I do to the slave module receives the signals I’m sending module that is as master ? the code that I did , isn’t working. You could guide me on what to do ? If you want to connect 2 HC-05s together then one of them must be a master and one must be a slave. As you have found out, when using an Android device it is regarded as the master device and the HC-05 must be the slave. My solution would be to have the HC-05 connected to the AVR as the slave. Then set to HC-05 connected to the game pad as a master. You can then connect an Android device or the game pad to the AVR. Thanks, Sir. In my country, your knowledge on the subject is like a “bible”. I will follow all your instructions and try to achieve the goal. Greetings ! Sir Martyn, just one more question and I promise that I do not bother you anymore. Is there any other Bluetooth module that can be connected to an Arduino and enabling connection with an HC-05 module, both as “transceivers Slaves” ? Thank you in advance. The HC-05 can be either a master or slave. You set which one through the AT commands. 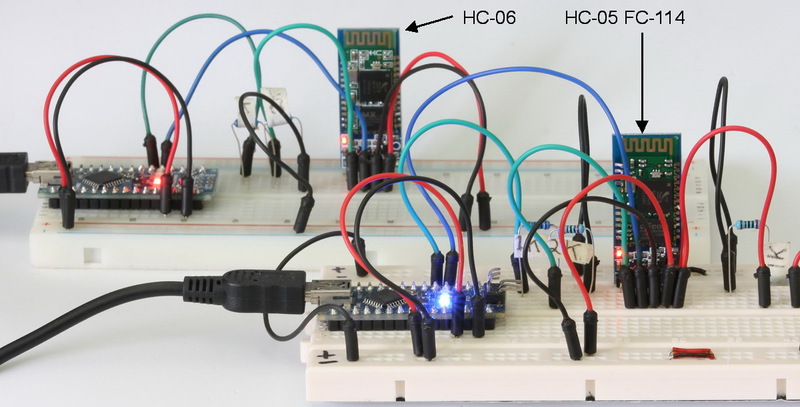 The Arduino can control the HC-05 and can change the HC-05 settings automatically. You just need to have a way of putting the HC-05 in to AT mode. Remember though, different modules have different ways of doing this. 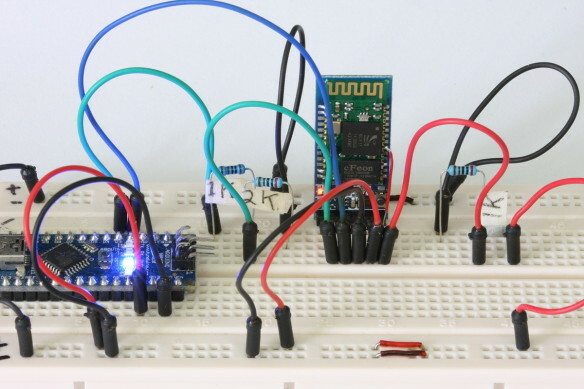 Once the HC-05 is in AT mode you can use the Arduino to issue AT commands. Have a look at Entering AT Mode Method 2. Using the Arduino to Control the HC-05 which is part of the http://www.martyncurrey.com/arduino-with-hc-05-bluetooth-module-at-mode/ post. Please note that the method to get in to AT mode may not be the same for your module. For example if you have the FC114 version you will need to add a wire to pin 27 or pin 28, see above. I have some problem calling AT+INQ when in AT Mode. Did I done anything wrong here? I tried using “AT+INIT” the HC05 will just blink rapidly and no “AT” commands could work, unless pulling the EN wire to low while pressing the button on HC 05. The model I am using is FC 114 and running on version 2.0-20100601. Hello Martyn, I can build up with 2 modules HC6 a connection BT and how this goes. HC-06 modules are slave only and cannot connect together. You need a master and a slave to form a connection. This means at least one HC-05. i have two module HC-05(zs-040) and HC-06(fc-114), can i make both modules auto connect ? If you have the older zs-040 board see http://www.martyncurrey.com/connecting-2-arduinos-by-bluetooth-using-a-hc-05-and-a-hc-06-pair-bind-and-link/. Note. There are newer zs040 modules that have a blue LED on the daughter board. There have a different firmware. I have not tried these yet. 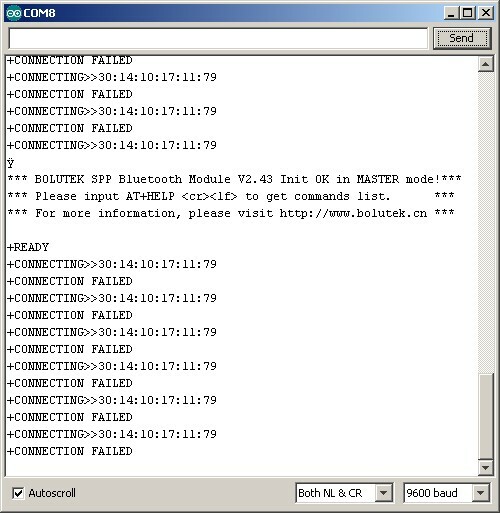 now, if modules is connected, i will turn on pin 13 !! 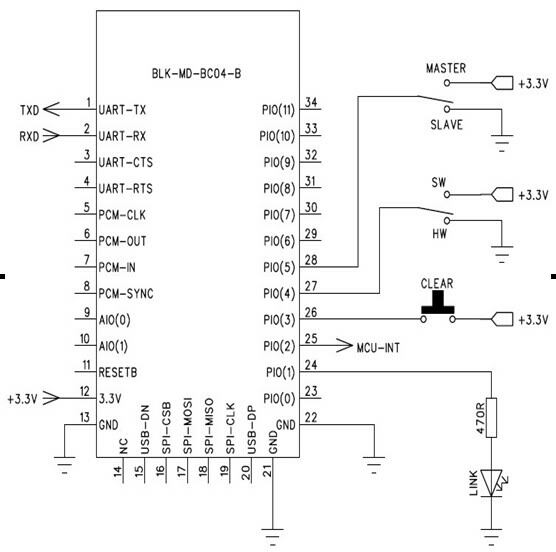 // BT VCC to Arduino 5V out. // Echo the user input to the main window. The “>” character indicates the user entered text. I have change the baud rates, no luck. what’s wrong with my module? is it broken? wrong library? Hi, I did it by changing the baud rate 115200. it’s kinda strange but it works like a charm. Now, I still struggle to get it in at mode. Even though I am not using an Arduino board, I wonder if you can help me. and then I enter a loop where I can read and write. This works fine but only for the 60 seconds specified in the PAIR command and then it disconnects. I don’t mind that. I get the connect but can not transfer data. The LED on the HC-05 does not blink as it does during the 60 seconds of the PAIR command. Can you tell me what I am doing wrong or where I can find an answer. HC-05s remember the last 7 devices they have been paired with so once you have paired you do not need to do it again so it does not need to be part of the routine. Do it manually and forget about it. 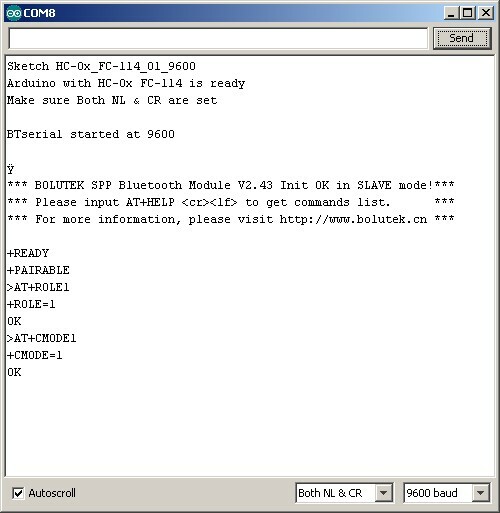 Making connections with Bluetooth Classic is a two stage process; pairing and then connecting. Pairing allows the two devices to talk, it does not actually form the connection. You don’t say which HC-05 you have so it’s hard to know for sure but I initially suspect the Android device is acting as the master not the HC-05 but I may be wrong. If not already, try going through the process manually. This will require some kind of serial in / serial out routine. Like the one above but for you board. A USB UART adaptor and a PC with a terminal app can be used as well. Although basically the same, have a look at http://www.martyncurrey.com/connecting-2-arduinos-by-bluetooth-using-a-hc-05-and-a-hc-06-pair-bind-and-link/ which goes through the process for a slightly different Bluetooth module. Hello, i have firmwave HC-05 version 2.0-20161226. Name modul H-C-2010-06-01. Comand AT+INQ error 1F? What is the problem? Help. I enter the following commands. 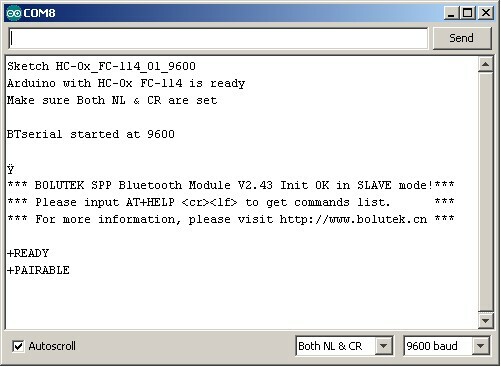 Slave module N2 (HC-05 slave) – OK, i`m see from may android phone. I can’t think of anything of the top of my head. When I get time I will try to look in to it. I am not certain but it looks like the telescope has a CAT5 socket so you may need an adapter. Once connected you should be able to pair with a master device and then talk to the telescope. The HC-06 is a slave only device which means it can only accept a connection request it cannot make one so you would need a master device such as an android phone to make the connection. You may already be aware that the HC-06 is Bluetooth Classic only and as such will not work with Apple devices. For Apple you need BLE. I am not familiar with the Meade Lx-200gps but there is quite a bit on line and googling “Meade Lx-200gps telescope bluetooth” should give you plenty to read.